Learn how to tie a Celtic heart knot to be used in a Celtic Heart Knot Garland for decor, gift-wrapping, or a fun kid’s craft. 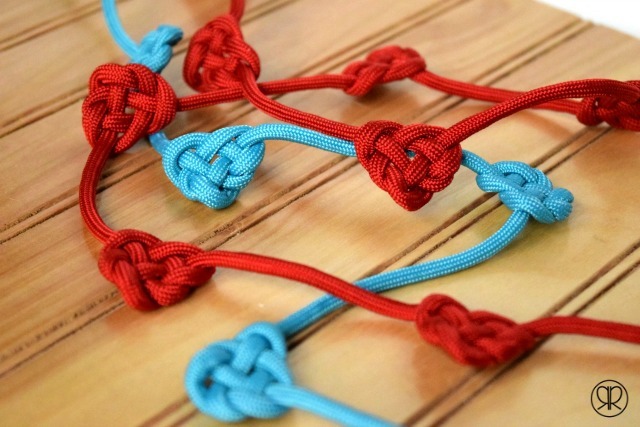 We’ve made our Celtic heart knots from Paracord, an inexpensive item available in so many colors! If you need a quick bunting, kid’s necklace, or package decoration, we have a ridiculously quick craft in store for you today. You’ll need a bit of Paracord, your fingers, and 5 minutes. This quick garland is put together using only one supply: Paracord. It’s very inexpensive, either in the craft store or on Amazon. I bought this 100 ft bundle for $8 – when paired with free Prime shipping, it’s a better deal than the craft stores which sell it for about $2.50 for 15 feet. Commonly, this Celtic heart knot is used for necklaces or bracelets, but when you tie multiple hearts in a row, it gives it such appeal. Anyway, after trying a few ways to tie a Celtic knot, it becomes pretty easy and you figure out the whole “adjust until tight” bit. The most viewed video on YouTube is TIAT’s. I will say, however, that I found this one to be how I prefer to tie the Celtic Heart Knot garland. So now I have about 85 feet of Paracord left… Got any ideas for using it? Save this to Pinterest to come back to later. Your shares are how we grow and we sincerely appreciate them. Learn how to tie a Celtic heart knot to be used in a Celtic Heart Knot Garland for decor, gift-wrapping, or a fun kid's craft. There are many ways to tie a Celtic heart knot garland, but check out the two Youtube videos above for step by step visual directions. What a lovely simple knot. Thanks very much! 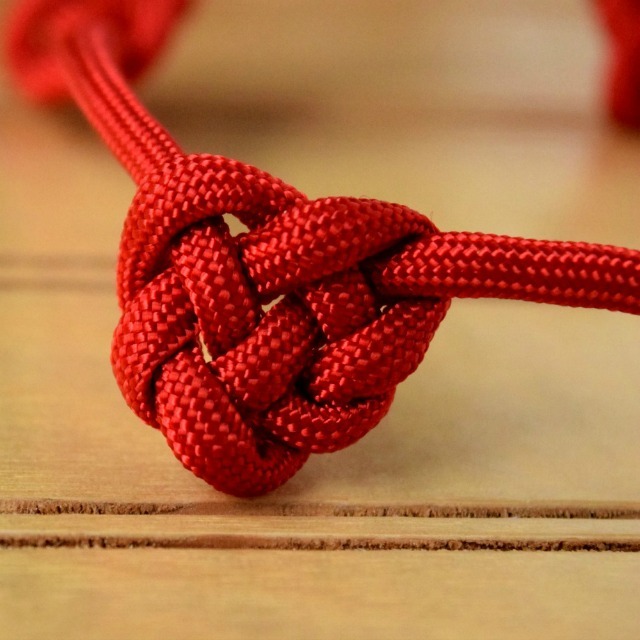 I am generally not good with knots, but this one – I picked it up. Yayyy! I have tried learning celtic knots before this and have failed. Perhaps I started with difficult ones. Thanks again! I love, love, love this heart!! Also, middle of the night web surfing is sometimes the best thing! Thank you for linking up for Pinworthy Wednesday! Very true, Raewyn – late night Internet surfing is sometimes the only kind of Internet surfing I can fit into the day. Thanks for dropping by from the party. Thanks, Joy. I’m quite spoiled now because of Prime and I just found out you can ‘gift’ it to family members for free. Amazon is sort of cornering the market on wicked-fast shipping! Thanks for sharing this at What’d You Do This Weekend. I want to try to make this. I think my granddaughters would find them charming. Featuring you today at Friday Favorites! Thanks for linking up! Eeek, thank you so much for the feature, Heather! Will be there again this week – thanks for hosting such a fun party. Oh gorgeous and so many possibilities. Featuring when my link party opens up tonight! Carol, thank you so much for the feature. And you’re so right – the possibilities just keep coming with this little garland. “I’m so athletic, I surf the internet”– I’ll be laughing about that one all day. what I meant to say was…..
Haha – A girl after my own heart, Stella Lee! I’ve added this to my pinterest valentine board – I’m going to have to give them a go! Thank you so much for the pin. They are easy to make but it takes a few minutes to figure out how much space between them to use. I started off with many inches and in the end, started tying them with only about and inch of “free space.” After they are pulled tight, the space between the hearts really opens up. Thanks for the great tutorial. I think this would be amazing done in twine with some burlap bows for a garland. Gonna try it…thanks! What a great idea – it would yield a wonderful “shabby chic” effect. I have personally never made any knots at all but I do love how this came out. Although I know you said it would take me 5 minutes I’m thinking I might have to add a 0 to the end of that and make it 50. Yes, yes now where is the summer Olympics sport for surfing the internet? My Google foo is very strong. I bet I could even win in a competition! 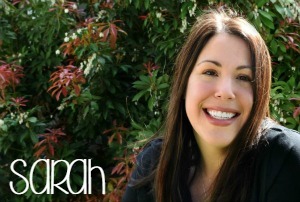 What a simple and cute project Sarah. Thanks for bringing the good all of the way around over here today! I love this! It’s so beautiful and elegant! Aw, thank you so much, Heather! Coming from you (and your wonderful projects) that is such a compliment!